Building your automation functionality into reusable components, Sub-flows, enables you to design automation flows faster and significantly reduces maintenance. Sub-flows consist of existing building blocks or other sub-flows and can be added as many times as needed inside any automation flow. One way is to select a part of an existing automation flow, right-click on one of the selected elements, and click “Create Sub-flow”. 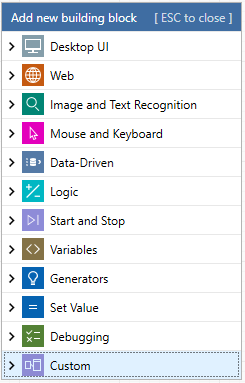 This will prompt you for a title for the sub-flow and will wrap up all the selected building blocks and connectors into a new Sub-flow. In the example above, four building blocks are selected to create a new sub-flow, named “Check total”. 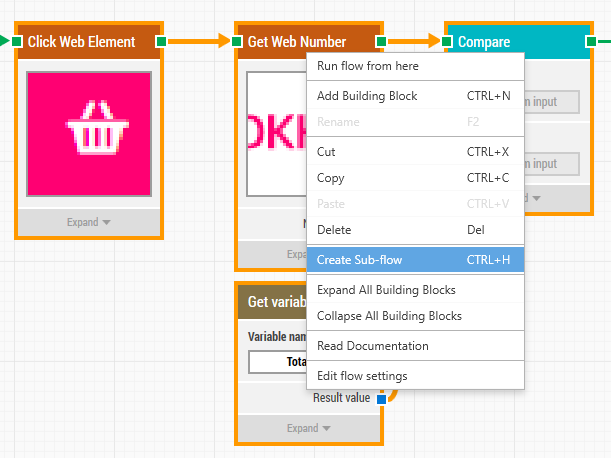 The second way of creating a sub-flow is to right-click anywhere in the flow tree-view and select “Create sub-flow”. This will create a new, empty sub-flow. Sub-flows can be dragged to any folder or be placed below a specific flow. Since Sub-flows are shared across all folders and flows in the tree-view, it often makes sense to organize sub-flows in a dedicated folder making it easy to find and implicitly understand the usage of a Sub-flow. To add a sub-flow to a flow, simply drag the sub-flow from the tree-view and onto the Design Canvas. Another way is to right-click the design canvas, select “Add building block”, and then select the sub-flow from the “Custom” category. There are several instances where you would want to edit an existing sub-flow. For example, to add parameters and additional Connectors, to simply update the functionality inside the sub-flow, or to rename the sub-flow. When a sub-flow is updated, all dependents (flows using the sub-flow) are automatically updated. This is why using sub-flows is a great way to reduce the burden of maintenance. To edit a sub-flow either double-click the building block from the Design Canvas or open it from the tree-view structure. 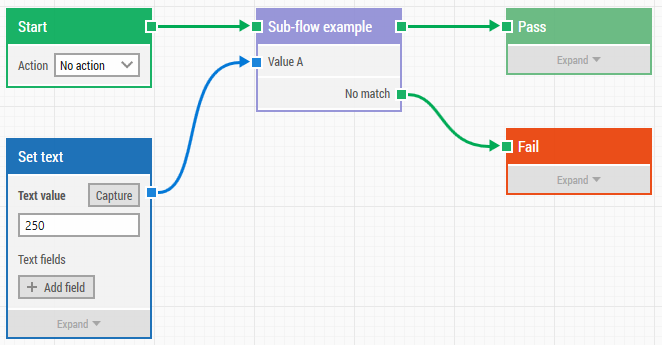 Adding parameters is a valuable feature of sub-flows. This increases the re-usability and allows for the sub-flows to be completely data-driven. Parameters are defined by a specific category of building blocks that can only be used inside sub-flows: Value Input and Value Output. 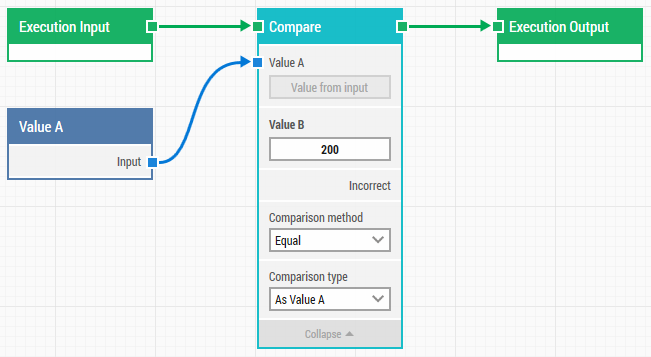 A sub-flow can contain any number of input and output parameters, and it’s possible to change the name of the parameters, by changing the name of the Value Input and Value Output building blocks. To change the name, double-click on the title of the building block and enter the new title. In the example below, one input parameter is added to the sub-flow. The parameter is renamed to “Value A”. The green Connectors on a sub-flow are defined by a specific category of building blocks called Execution Input and Execution Output. It is possible to have multiple connectors to and from a sub-flow, although typically only multiple output connectors, which means the sub-flow can be used to handle branching of the flow, exposed as two or more output connectors. In the example below, the sub-flow has two output connectors depending on the comparison operation. In case the input value matches ‘200’, then the top green Connector is triggered, otherwise the ‘Incorrect’ green Connector is triggered. To make the sub-flow even more useful, the second green Connector has been renamed to ‘No match’. When a sub-flow is added to an automation flow, the sub-flow will by default have the given name of the sub-flow, i.e. the name shown in the tree-view. Whenever a sub-flow is changed, it is automatically reflected in the flows containing the sub-flow—except for changes made to the name of the sub-flow. 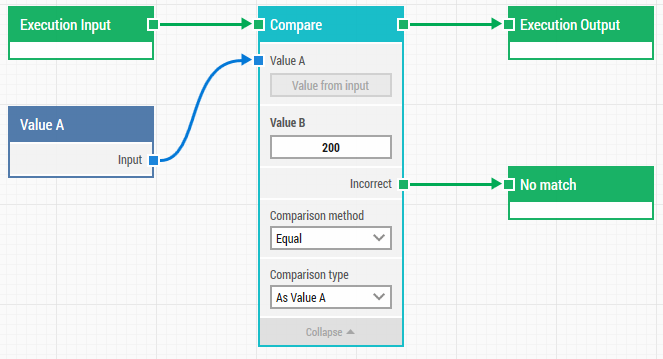 Once a sub-flow is added to a flow, the user designing the given flow is free to change the title of the specific instance of the sub-flow building block inside the flow. This means that if the name of the sub-flow is changed, i.e. by right-clicking in the tree-view and selecting “Rename”, then the title of the sub-flow block in the current flow will not change.